Southeast Asian megacities are known around the world for their snarled streets, daring drivers, and smog-tinged skies. Saying Bangkok, Hanoi, or Saigon may invoke images of motorcycles and swerving taxi drivers, but one Southeast Asian city stands out from the rest for its interesting array of vehicles and how they drive: Rangoon (Yangon), Burma (Myanmar). One thing that makes Rangoon unique among Southeast Asian cities is the lack of motorcycles and motorbikes. They were banned from Rangoon several years ago when a motorcyclist struck a vehicle driven by a military official. While Rangoon certainly does not have as much traffic, congestion, or pollution as the aforementioned cities, it makes up for it by being a literal boneyard for a hodgepodge of right and left-side drive second-hand imports from Japan and South Korea that all drive on the right side of the road! I first noticed this when my driver picked me up at the airport. He was seated on the right in a vehicle with a Japanese language navigation system, yet we were driving on the right side of the road! Below is a right-side drive Japanese bus in the heart of Rangoon. Car enthusiasts should check out the interesting traffic situation in Burma before it is too late and the all the clunkers on the road are replaced with new busses and cars with left-side steering wheels. There are even traffic cops who direct traffic at a few major intersections in the city. Following the end of British rule in 1948, Burma fell under authoritarian rule for nearly six decades. With limits of free speech, a police state, and a government-run economy under a military dictatorship, Burma’s economy suffered mightily. Today’s bustling shops and streets are in sharp contrast to what the country faced several decades ago. The lack of economic activity with the rest of the world left behind two very visible legacies: beautiful, yet crumbling, Victorian-style British colonial architecture and old, rusting, imported cars with right and left-side steering wheels all driving on the right side of the road. I was prepared to see old vehicles on the streets of Rangoon when I arrived last year, but I certainly did not expect to see the wide array of Japanese and Korean imports that I did. As a Japanese speaker, it was fascinating to encounter decades-old Japanese tour busses and refurbished kindergarten (幼稚園) busses on the streets taking Burmese from point A to point B in Rangoon. About seventy percent of the public transportation busses I saw on the streets were second-hand Japanese imports, which still bore the Japanese characters denoting their former purpose and destinations in many parts of Japan. Tour busses served different purposes in Rangoon. Kindergarten busses transported passengers in Rangoon and Bago. Even old metro busses were refurbished and turned into Rangoon’s public bus system. To the untrained eye, this may seem interesting, but because the Japanese drive on the left side of the road, many of these busses were retrofitted with cargo airplane-style netting to seal off the Japanese doors. These doors were replaced with cutout doors to ensure passengers did not get off the bus into oncoming traffic. It was quite fascinating to see these old vehicles still going around Burma. Their bright colors, faded façdes, and dirty windows would tell many stories if they could talk . Another interesting aspect of the traffic in Burma was the presence of old Korean public transportation busses that served the same purpose as the Japanese busses on the streets. The only difference between the two is that the Korean busses have left-side steering wheels, making it easier for them to maneuver through the right-side drive Rangoon streets. Much like their Japanese counterparts, the Korean busses were very visible as Burmese script covered up or surrounded Hangul as if it was not even there. Without money to repaint or strip advertising off of these busses and cars, Rangoon’s streets offer the chance to see a virtual boneyard of Japanese and Korean public transportation vehicles on their last legs. Away from Rangoon’s city center and in other, more rural parts, like Bago, you can also encounter Soviet and Chinese-issued military vehicles that have been retrofitted and refurbished for both civilian and military purposes. While many tourists come to Burma to enjoy the famous Buddhist sites like Shwedagon Pagoda and other towns like Bago and Pagan, there is much to see in Rangoon. Aside from the fantastic British architecture, car enthusiasts should set aside some time to see the boneyard that exists on Burma’s streets and alleyways. This “Good By” bus is a fitting end to this article. I don’t know what the most exciting part of traveling is for you, but one of the moments I anticipate the most when I travel is getting a new passport stamp, whether it be on entry or exit into a new country or my current country of residence. While our encounters with customs officers may not always be brief or enjoyable, there is (usually) one payoff at the end of the questioning period: the coveted passport stamp. From entry to re-entry permits, student and work visas, temporary visa-free stamps, and other visa-on-arrival programs, our passports tell stories not only about ourselves, but about the travels and journeys on which we embark when we have the time and money. I recently filled up an entire page of my passport with visa stamps from Korea, Japan, and Singapore, and I realized my passport would have some fascinating stories to tell if it could speak. Here are some of those stories, from the first visa page. As I open the first page of my American passport, with its chipped cover and its unraveling sides, I begin the journey down the trail of my life for the last three and a half years. The first pages boasts a full-page Japanese student visa complete with my Afro, which was my signature style for several years during the early 2000s up until about 2012. “How did I look so young,” I always ask myself, but the second page is where things get even more interesting. Even better yet, I still don’t know how I made it in Japan when the only Japanese I knew was self-taught on the grueling plane flight from New York to Tokyo. 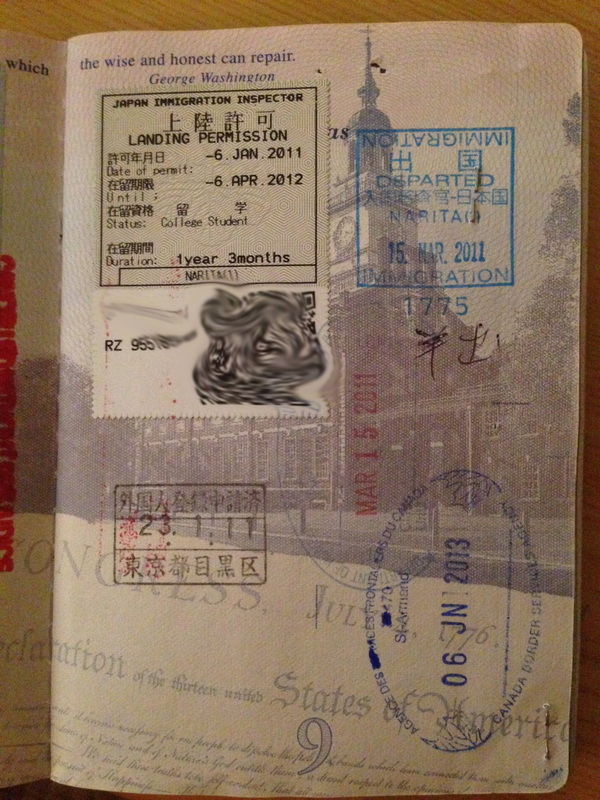 There is a landing permission sticker granted by the Japanese government under its old immigration system, which basically signifies that I have permission to remain in Japan for fifteen months (in 2011-2012), but not express written permission to leave without paying for another sticker to be put on that page. Underneath that lies the proof that I went to speak to immigration officers at city hall in Tokyo’s Meguro-ku (目黒区) neighborhood to register as a foreign resident. It’s amazing how my long journey back to Japan can conjure up so many memories when just looking at a page inside of a flimsy book. Even more telling, though, is the other stamp I have on that page: a departure stamp from Narita International Airport, dated March 15th, 2011. One of the defining moments of my life up to this point is definitely the Great Tohoku Earthquake, during which I lived in Tokyo. Seeing that stamp triggers flashbacks to my frantic rush to the airport while trains were still not running on schedule. I will write about that experience in another day. This page appears to be a window into my soul for Asian travels, but it gets even better upon further examination. My friend Andrew and I were able to snag the elusive Canadian entrance stamp during a road trip through Montreal and Quebec City en route to Fundy National Park back in 2013! After going through a barrage of questions about drugs and alcohol, we had a short talk with customs officials and they agreed to I’ve us the entrance stamp at a small border crossing between Vermont and Quebec. The unique thing about this stamp is how the French is on the top of the stamp with English on the bottom half of the stamp. It was a sign of things to come for what we would encounter during our road trip through French Canada. Turning to the next page, I see a myriad of stamps and staple holes, but my most prized staples come from the two Special Administrative Regions in China, Hong Kong and Macau. Last year, the authorities stopped stamping passports in these two cities, and I would be lying right now if I was happy that my passport has flimsy pieces of paper stapled to it instead of having actual stamps. Still, they make for an interesting story. I remember speaking with the authorities and asking for a stamp but they regretfully informed me that they were no longer issuing stamps. This encounter was certainly the low point of a remarkable first trip to Hong Kong and Macau. I have been back three times since and each city always gives the same piece of paper, affixed to the passport. Nothing beats a stamp, but I will settle for the stapled visas. The next page of my passport conjures up memories of my marathon trip through Southeast Asia this year, with stamps from Singapore and Thailand playing predominate roles. The extravagance of the airport in Singapre coupled with the magnificent view from atop the Marina Bay Sands pool deck coupled with the tough immigration in Bangkok re-enter my mind as I look at this page. Further down on this page, there exists a phantom stamp of sorts, an Ameriacn re-entry stamp without an exit or entry stamp in its vicinity. I went to Israel in 2011 and this stamp actually became an issue at the border crossing station in Jolan Bator, Malaysia. I was grilled by immigration about this stamp but actually ended up having no problems at the end of the day. Why is there no stamp to match up with this American one? It’s simple: Israel. At Ben Gurion Airport, I handed over my passport to the official and asked for the stamp to be put in my passport, but the official refused, and perhaps it was for the better: I may not have been able to enter Malaysia that night had there been more issues. i clung to my passport all night on the overnight train from Singapore to Kuala Lumpur. The next page in my passport is filled with even more interesting stories, ranging from a one day junket by ferry from Singapore to Indonesia and the subsequent exit and re-entry Singaporean stamps. Perhaps the most exciting and elusive stamp for Americans is the special stamp I have from China, documenting that I am allowed to stay in China for up to, but not exceeding, 72 hours as a part of a new visa-free stay program the Chinese government implemented for Beijing, Shanghai, and Guangzhou. I was fortunate enough to spend a night on the Bund and a day on the town before heading back to the airport after a 26 hour layover. The view from M on the Bund immediately comes to mind. The final page of stamps I have is the same photo that greeted you at the beginning of this article: stamps from Korean, Singaporean, and Japanese immigration officials. Each time I leave Japan on my work visa, I get a special stamp saying I have a certain resident status and that I am permitted to return to Japan on my visa. Seeing those reminds me of coming “home” to Japan, and also conjures up memories of my first international trip from Japan to Korea, last September, to see friends from college. I will be back to Korea again in the near future, but nothing will equal the excitement from the first time when I touched down at Gimahe International Airport last September. 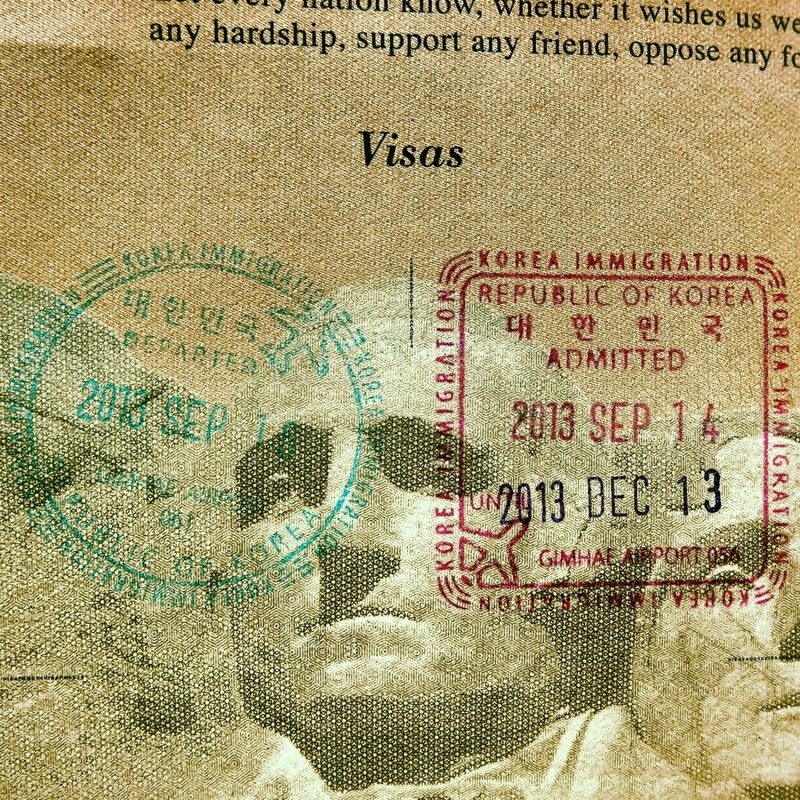 From the bind at customs returning from Korea this July to the relative ease with which I am usually whisked through customs in Japan, lost memories and images always come back to me when I look at my passport’s ever-filling pages. With an adventure to Taipei on the horizon within the next ten days, I felt the urge to flip through my passport, and my passport decided to bring back some great memories and long forgotten stores of being out on the road. Open your passport sometime and look at it. You’ll find out it is the shortest and most interesting novel you will ever read. 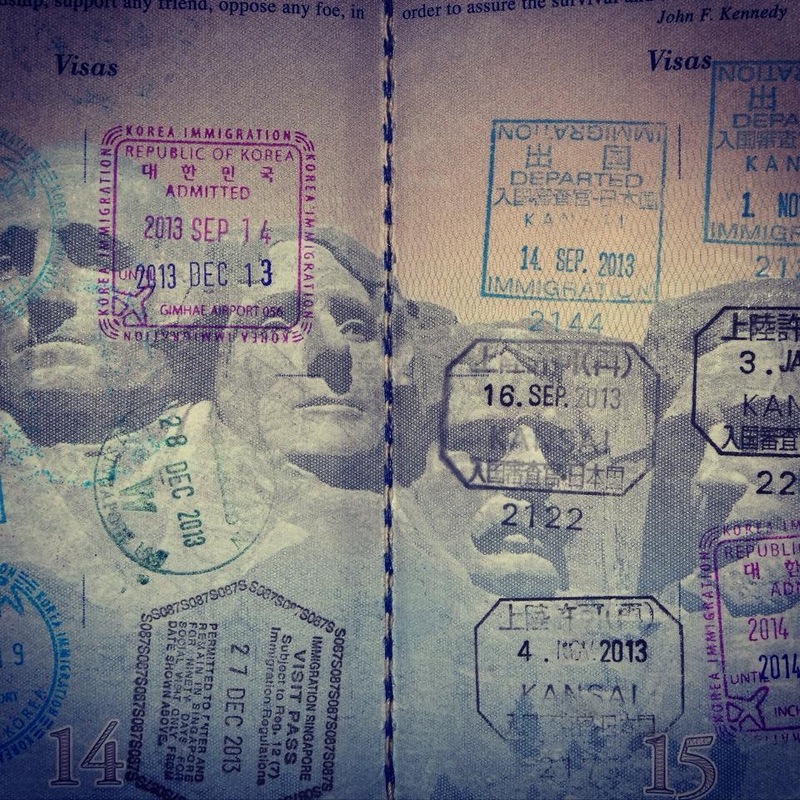 What stories and stamps does your passport hold? The one thing I feared most about traveling to Korea this weekend has begun to manifest itself in my thoughts this evening: I think I want to learn some Korean. While, on the surface, this may not seem like a bad thing, or even a worrisome point, it is very dangerous for me given all of the hard work I have put towards learning Japanese over the past two years. When I first came to Japan and started learning it two years ago, I had no idea what I was doing when it came to formal language study. I studied Spanish in high school, was good at it, but dif not find it challenging enough so I ceased studying it when I was in college. On study abroad, we were required to take a language class so I took Japanese with the intention of only studying it for one semester and calling it a day at my university because I had met the language requirement. Two years, a summer language school, and a return trip to Japan later, I think there is no doubt that I fell in love with studying Japanese and the nuances that accompany learning a new language so radical and different than Western languages, let alone English. The instant feeling of helplessness and being lost I experienced in Japan back in January, 2011, re-emerged as I stepped onto the bus which would take us from the plane to the airport in Busan, South Korea. There I sat on the bus in Korea, speaking Japanese with some new friends I made on the plane, staring at a sign with no idea how to read it. I even had less of an idea of what the sign meant aside from having what appeared to be a singing group pictured on it. From that moment on, I tried to absorb as much of the Korean I saw on the train as quickly as possible. The same goes for common words or phrases I heard inside of stores or in the open air markets which are sprinkled all throughout Busan and Seoul. What is this Hangul? How is it read? What does the ad mean? – Those were very common questions I asked my Korean friends. It was so frustrating for me to be silent when ordering something at the convenience store, but it was even more frustrating to not have the ability to read a sign. That is what frustrated me the most. And so the desire to learn a third language begun. Following lunch with my friend, I said a few words in Korean and even read some Romanized names on the train as we headed back to Seoul Station. She said my pronunciation was very good, which encouraged me to study some more Korean hen I returned to Japan. This poses two obvious problems for me. Firstly, where will I get the time to dedicate myself towards another language, especially when I have devoted so much time and energy to Japanese. Secondly, I am very afraid that if I start learning another language, I will lose much of my Japanese ability and Japanese skills that I have developed over the last two years in very intensive studies. Many of My Korean and Japanese friends say that the grammar is similar between the two languages. They also say that some vocabulary is shared, too. I just worry about forcing out the Japanese I have learned in lieu of a rudimentary level of Korean studies. Have you studied a third language? If so, how was your experience? Good evening. I have finally had a chance to gather my thoughts on this weekend’s Korean adventure for a proper post on the website! As soon as three years ago, if someone would have told me that I would be atop the Seoul N Tower in South Korea, I would have called them crazy. If the same person had said I would be there with a friend I met in college as a member of the International Student Association, I would have said they were absolutely nuts! I truly believe moments like this are what make life worth living and make it worthwhile to take chances and grab every opportunity that you get whenever it presents itself. The journey started on Saturday with a short flight from Osaka to Busan, South Korea. 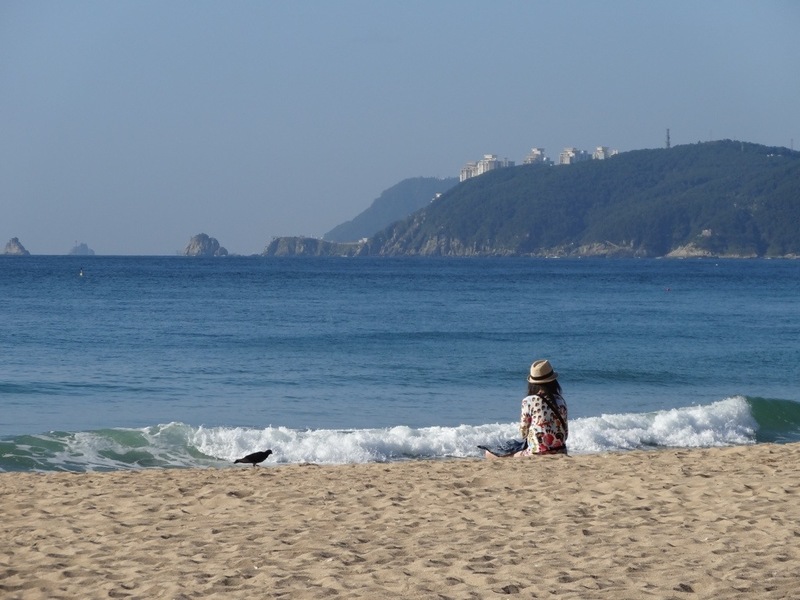 From there, I traversed through the city’s extensive metro network to the stop at Haeundae Beach, where my room was located. 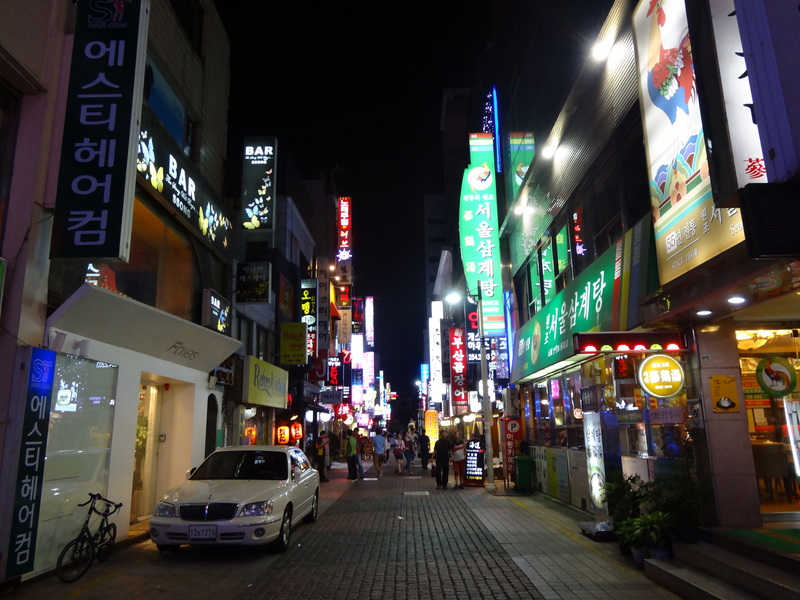 My first impressions of Korea were nearly exactly what I had expected and I was relieved. 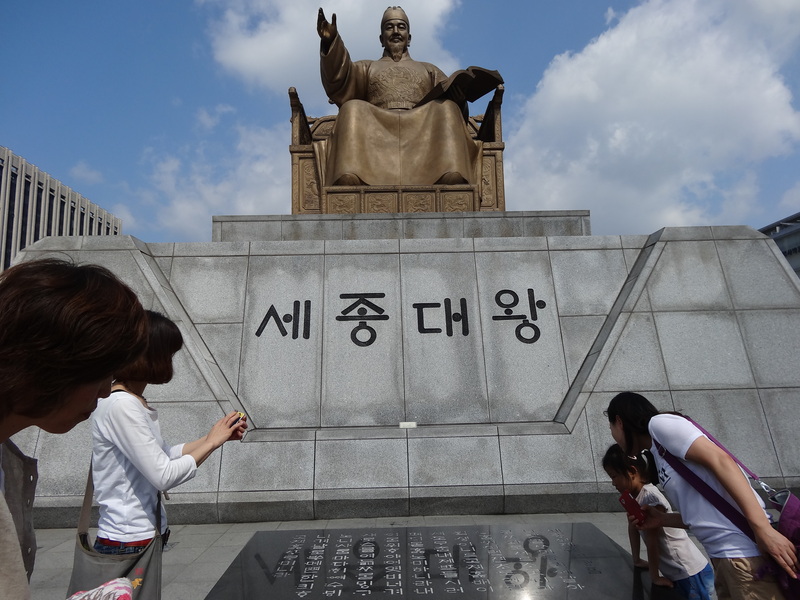 Many of my friends had been to Korea in the past, so it was nice that their advice and suggestions were accurate. 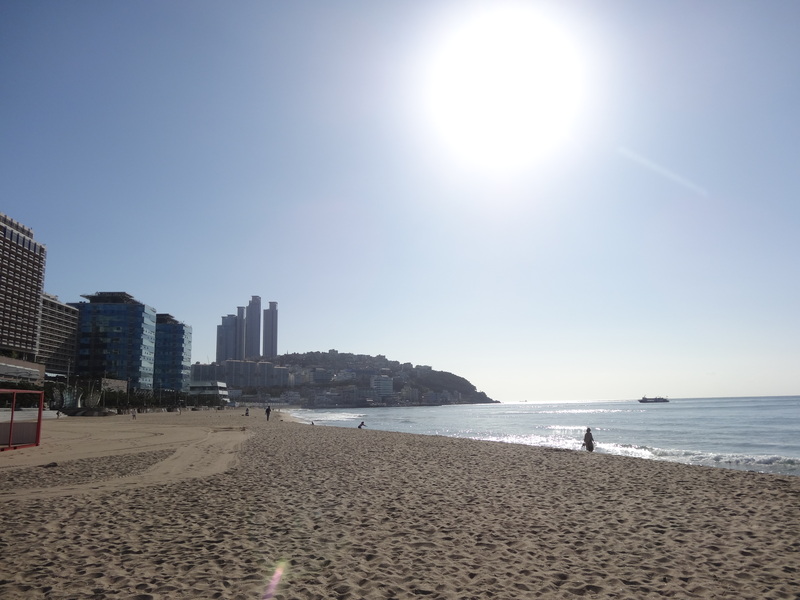 That afternoon, I spent some time on the beach, taking in some sun and photographing the elegant scene where the Busan skyline meets the beach. There is always something about the ocean that draws me in for an extended period of time. I stayed longer than I had hoped, but continued on throughout the evening in the general vicinity. 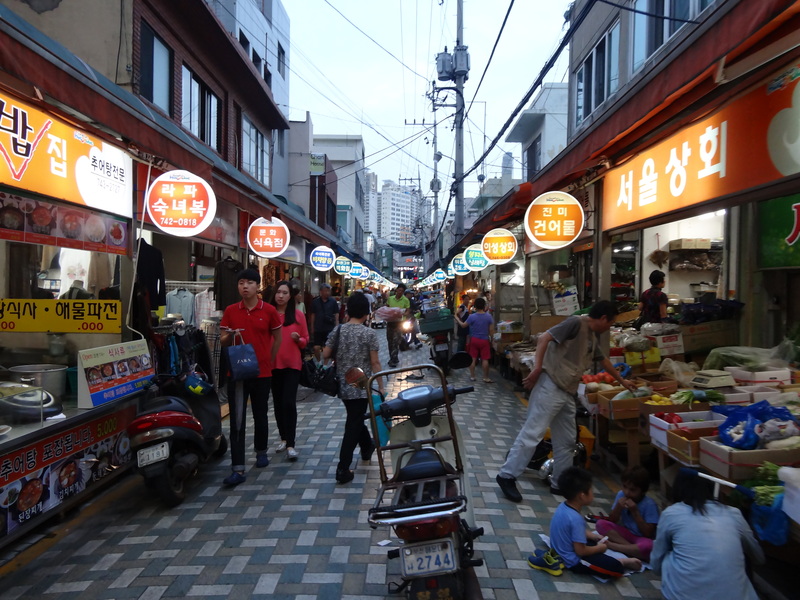 I took photos of the traditional marketplace and sampled some Korean food along the evening walk. The hustle and bustle of these crammed, narrow shopping streets is one of my favorite things about traveling, especially in Asia. Hearing the sounds of bartering, children running, and motorcycles serpentining through the crowd is something that everyone must experience once before they die. 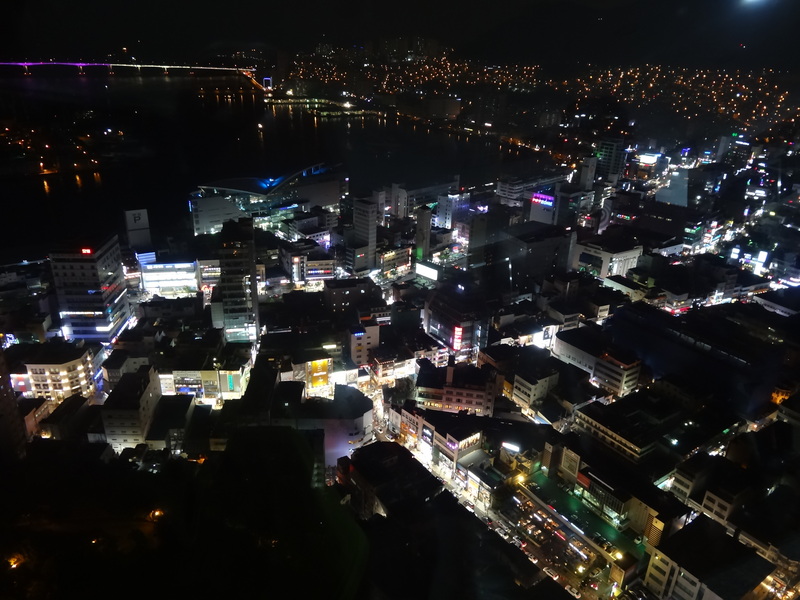 As night fell in Busan, I continued to Busan Tower to take in the city from above. I am always a sucker for night time city views, and Busan Tower did not disappoint! I then strolled through the International Film Festival area before heading back to my room for the evening. I had a ticket for the first train to Seoul on the KTX to meet my friend! After the fast, short, and cheap (thanks to the foreigner rail pass that Korea Railroad offers (http://www.korail.com/kr_pass.jsp), I was in Seoul by 10:00AM the following morning, where I met up with my friend for some traditional Korean breakfast and a tour of the city. It was amazing to meet one of my friends in a place so far and different than my university. Perhaps the most remarkable part about it is that she lives in Seoul, I live in Osaka, and we met in Seoul Station for a day out in her home city. We both remarked about how far away we were from Philadelphia. From the moment I stepped outside of Seoul Station, I felt a vibe of energy and excitement that I have felt nowhere outside of the United States except for Tokyo. It was at that moment where I began to have a very strong affinity towards Seoul. The bustling of the cars, the chatter of pedestrians, and the street vendors everywhere truly makes the city so great. We walked to a palace in Korea and I was able to take in some of the sights and sounds of the more traditional aspects of Old Seoul. 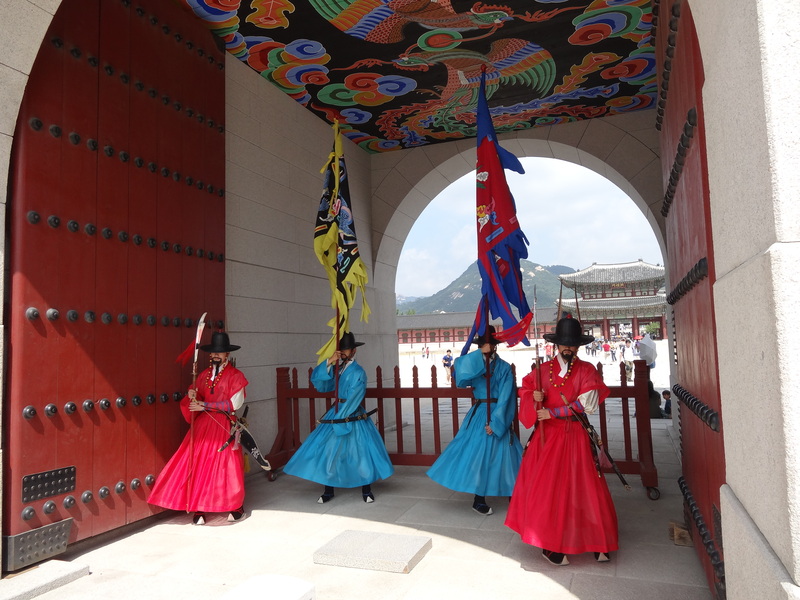 There were even traditional guards at the entrance! From there, we ate some more traditional Korean food and eventually ended up at Seoul N Tower following a short bus ride through the city. I love panoramic views of cities and all the industry and majesty that accompanies them, so I took many, many photos of Seoul from above. The locks of love that cover the fence at the base of Seoul Tower were remarkable, but so was the view from the observation deck. I have not felt this high up in my entire life when it comes to viewing a city from above the skyline. 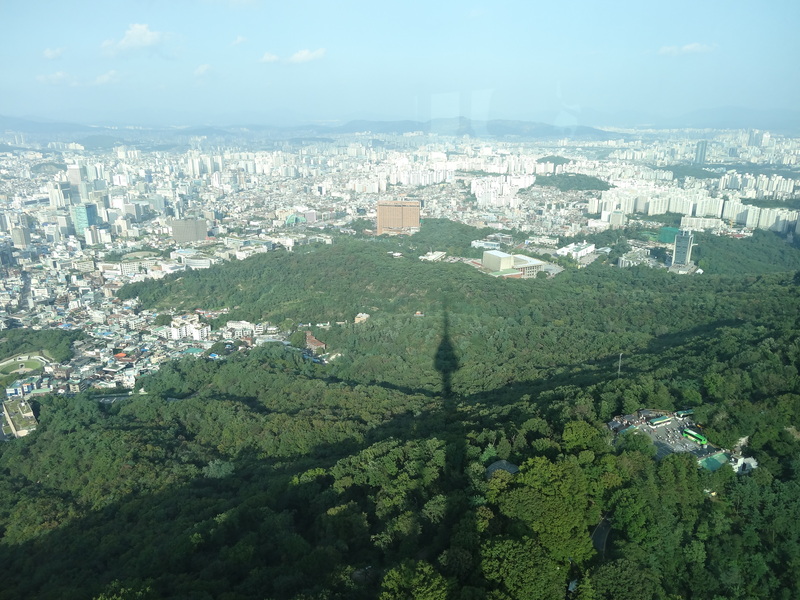 Check out the amazing view from Seoul N Tower. From there, it was off to the foreign district in Seoul, where we enjoyed some American drinks and appetizers to close out what was a remarkable day in Seoul. It was at that moment where we discussed our friendship in college, our travels, and what it was like to be meeting in Asia. It was also at that moment when I realized I was so happy that I joined the International Student Assocation at my school. Had I not taken a step outside the box to meet new people after I returned from my first trip to Japan, I never would have had the opportunity to meet so many people and make so many new friends who live abroad, especially in Asia. I never would have had a great tour guide and never would have been able to maneuver and get around in Seoul like I had done that day. 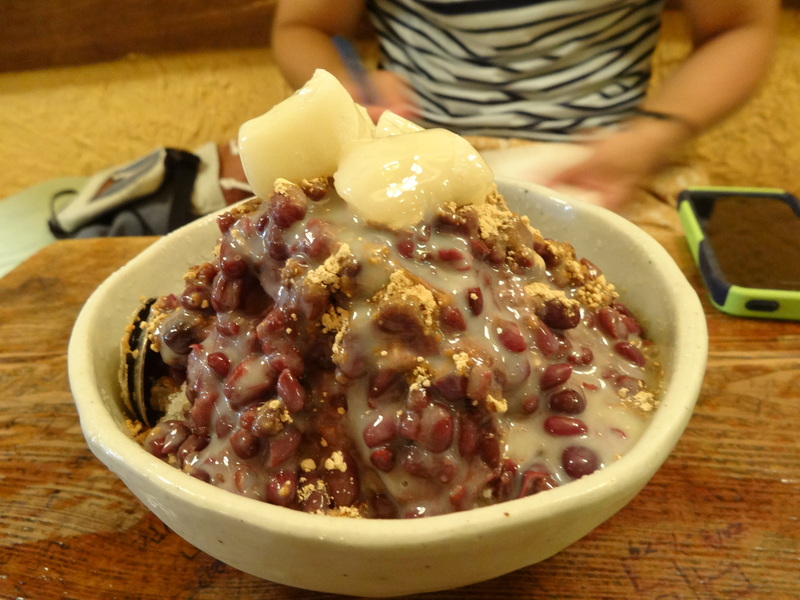 It is something I hope to replicate with future trips to Taiwan, Hong Kong, and subsequent trips to Seoul. If anyone is interested in traveling, cultural exchange, or meeting new people, I strongly suggest you get involved in your university’s international exchange programs. It will change you for the better. As our meal concluded, the reality hit that I would return to Busan for my flight out the next morning and my friend would return to Seoul for class in the morning. I took the KTX back through the night and arrived in Busan around 11:00PM. After frantically rushing to catch the last train, I returned to my room and went to sleep. I was fortunate enough to catch a glorious sunrise at the beach before heading back to the airport. I had what I considered to be a tremendous weekend in Korea: sightseeing, rekindling friendships, and sampling great food along the way. There is something to be said when you have a friend showing you the way through one of the biggest and most modern cities on the planet. I look forward to returning to Korea someday. I have just returned to Japan from my weekend trip to South Korea, and I must say that it was an amazing and memorable experience! I used the foreigner pass to rode the KTX from busan to Seoul so i was able to see the country’s two largest cities. South Korea is very similar to Japan in several ways but also very different at the same time. In tomorrow’s posting, I will discuss the things I liked about South Korea along with some things I did not like about South Korea. I will also talk about how this whole trip would not have been possible if I was never involved in the International Student Association at my university. The entire trip and rendezvous with friends in Seoul as opposed to my university is truly remarkable and amazing. I often think about why we meet people during life and my trip yesterday continues to bring that question to mind. If I had ended up playing football at Temple as I had initially thought I would, my whole life would be entirely different at this time! I am certainly glad things changed. Attached is a photo of one of the most exciting things about international travel- when you get your new passport stamps. This makes number 5 for me! 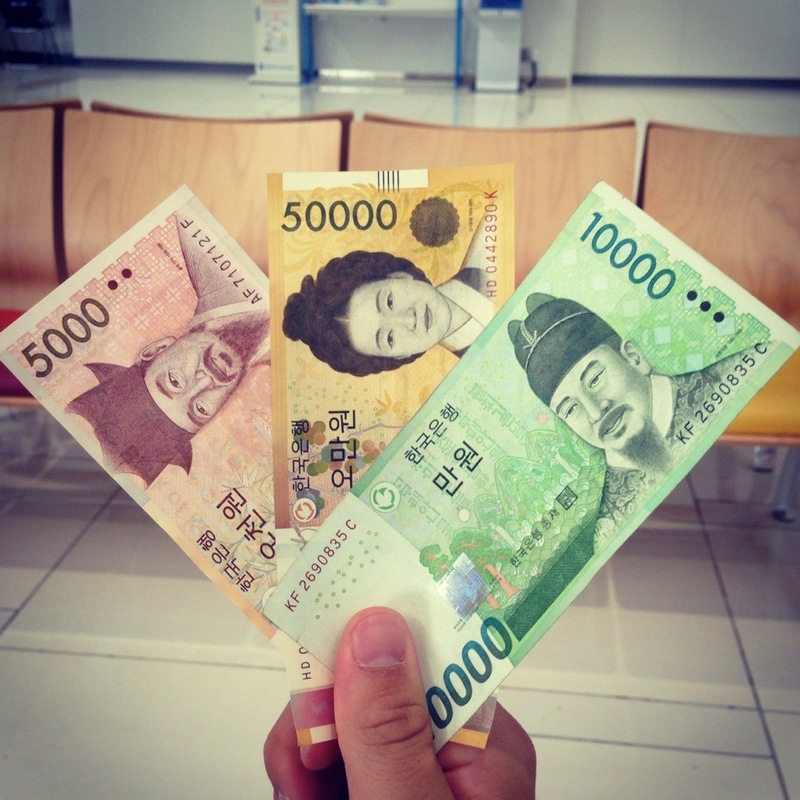 Korean Won in hand, waiting to board my plane to Busan! For those of you who have never met me, I have always been fascinated with adventure, travel, and finding out new things about new places and the new people I meet throughout the journey called live. This interest started as my family and I embarked on many summer road trips and vacations when I was a child. This weekend, a new chapter will unfold in the adventure I call my life. On Saturday, I am headed to Busan, South Korea, for my first trip in Asia outside of Japan. I cannot be more excited as I anticipate what should be an adventurous three day weekend as I traverse South Korea. When I returned to Temple University following the March 11, 2011, earthquake in Japan, I quickly became involved in Asian student associations and the international student clubs at school to try and help foreign students in the way they helped me when I was studying abroad in Japan. Throughout the next two years, I made many new friendships with foreign students; most of them residing in either Japan, South Korea, or Taiwan. This weekend, I will be meeting up with my Korean friends in Busan and Seoul to get a non-tourist perspective of the two biggest cities in South Korea. Following the first day in Busan, I will take the Korean high speed rail train to Seoul on Sunday for a day trip to rendezvous with some of my friends that I have not seen for several years. Then it will be back to Busan on Sunday evening followed to a return to Osaka on Monday afternoon. When I first started listening to Korean pop music, I was enamored by how glamorous Seoul looked, mainly because the scenes I saw reminded me so much of my third home, Tokyo. I cannot wait to see Seoul with my own two eyes! Each day I am in Japan it truly amazes me how I am able to communicate with the Japanese and my friends in another language. I will never forget the first time I went to Japan, not knowing Japanese. It transformed me forever and spurred what is a strong and unwavering interest in the Japanese language. I am hoping my first trip to South Korea has a similar affect on me, albeit the situation will be very different than my first trip to Japan. I am blessed and very fortunate to have friends willing to show me their country, even if for a day or weekend, and look forward to learning as much as I can. Of course, many photos will be taken. If you are a university student in the United States or interested in foreign language or travel, I highly recommend you join your university’s international student organizations, etc. You will have a priceless opportunity for meeting new friends, networking, and learning about yourself. Having a travel partner isn’t a bad bonus, either.